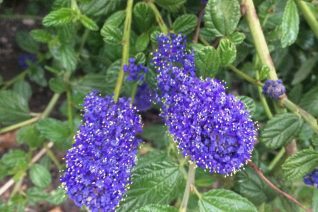 What a surprise this very dark, dark, dark blue flowered Ceanothus has turned out to have excellent cold hardiness. In our climate it is a low and spreading evergreen shrub with glossy leaves. To 3′ tall by 6′ wide in 6 years. In April/May a profuse display of the darkest cobalt blue flowers mass over the whole plant. Its so dark that it can seem like shadows over the plant but closer inspection reveals the intensity of the color blue. Full sun to light shade in average soil. Tolerates clay soil as well as withering summer drought. Prune if needed lightly after blooming has ended. This is a great drought tolerant, heat tolerant low shrub for hell strips. No summer water please. Well scaled for hell strips, low massing or a higher ground cover for hillsides. Fast growing to its ultimate size. For cold gardens this is an excellent cultivar and its a version of a species native to the Willamette Valley south into California. Small green wedge shaped evergreen leaves on an arching, somewhat angular shrub. 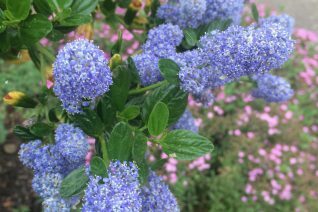 In April and May clouds of soft violet blue flowers swarm the whole shrub. Beautiful. To 7′ x 7′ very quickly in poor to average well drained sites. No summer water once established. Handsome at all times. Excellently adapted to rough urban life where compacted soils, reflected heat and little water is present in summer- thrives in all those conditions. Full sun. Easy. Oregon native plant. A UK selection of our own west coast native wild lilac. And they did a good job. 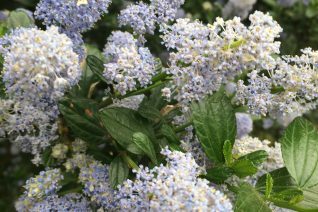 Large mounding evergreen shrub that puts on a spectacular display of deep blue flowers for nearly all of April into May. Fast growing to 5′ x 7′ very quickly in average well drained soil. Little to NO summer water. This cultivar has HUGE trusses of scintillating blue flowers. 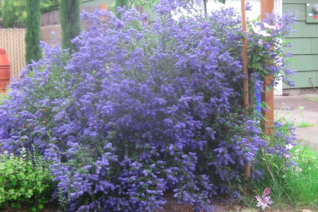 The largest of any Ceanothus that we grow- the reason why it is such a brilliant plant in bloom. 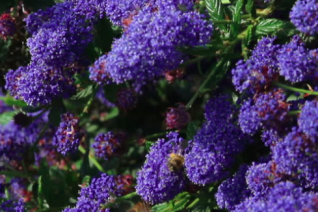 Loved by pollinators of all kinds and especially tempting to large black and yellow bumble bees. Prune after blooming if you need to re-size the plant. Good cold hardiness. Best in a hot aspect. Good job to our friends in the UK. 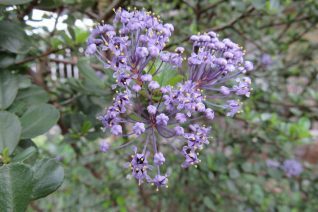 The glory of this large, wild evergreen shrub occurs in April when the branches are awash in deep violet blue flowers.The darkest hue among this species. A fast growing very large shrub to 8′ x 12′ wide in time. Excellent for wild uncultivated areas. A handsome spreading deep green evergreen of great drought tolerance. Tolerates most soils that never become boggy. Good cold hardiness to 5ºF. No summer water when established. Loved by bees and butterflies. Takes well to pruning. Blooms on wood from the previous year, prune if needed after blooming. Tolerates part shade. Blooms best in full sun. 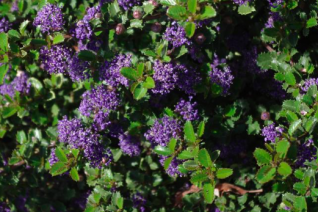 The most popular ground cover Ceanothus and an important plant in our climate. Evergreen ground cover shrub that covers the ground densely. 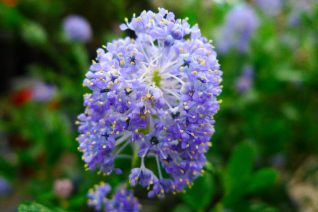 In March the entire plant is smothered in light violet blue flowers. Stems root where they touch the ground making it a valuable erosion control. Full sun to light shade in any well drained soil. Excels on steep slopes. To 10″ tall and 3′ wide very quickly. Plant on 3′ centers for a fast dense ground cover. Excellent performance in Hellstrips. Little water once established. Moderate deer resistance. Greg and I found this distinctive form of Coast Blue Blossom in the wild. This species ranges from Lane County, Oregon to Santa Barbara County, California. A fast growing seral species that follows fire and disturbance. Very near the location where we discovered this handsome small tree was to the largest Ceanothus thyrsiflorus ever discovered in 1925- it was nearly 30′ tall. This is a large and fast growing evergreen tree with copious amounts of scintillating flowers. 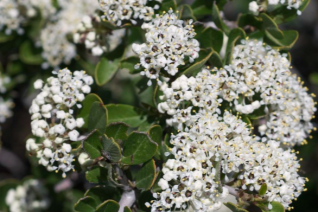 It has smaller deep green leaves and huge trusses of soft turquoise flowers in late April to early June. A tall growing tree/shrub that attains heights of 15′ very quickly if allowed. This drought tolerant native takes very well to pruning too- which should be done after blooming. Full sun and average well drained soil- including clay soils. Little to no summer water when established. Excellent for use as an instant screen or informal hedgerow. Pretty in the background of dry borders. Loved by bees and butterflies in bloom. 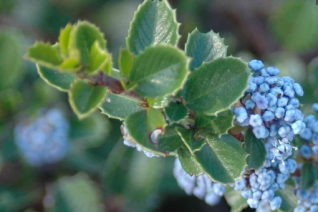 Very easy to grow native evergreen shrub that should be used more. Life span 15-20 years. Oregon native plant.